1852 Messrs J Cookson were lead merchants at Upper Thames Street, London, with manufacturing works at Newcastle. 1855 William Isaac Cookson and Co, were paint and colour manufacturers, of West End of Close, Newcastle. 1858 W. I. Cookson, refiners of antimony, manufacturers of lead, white lead, red lead, white paint, sheet lead, rolled pipe and venetian red, at 71 Close, Newcastle; shared premises with Cookson, Cuthbert and Co bottle manufacturers. Also William Isaac Cookson, lead refiners, at Hayhole, Ulgham, Northumberland. Also coke manufacturers, at Mickley, Gateshead. Also chemical manufacturers at Pipewell Gate, Gateshead. By 1863 The alkali trade had been developed to an extraordinary extent, such that it was making about 47 per cent. of the whole amount made in the UK. 1876 “NOTICE is hereby given, that the Partnership lately existing between William Cuthbert, William Isaac Cookson, John Cookson, Norman Charles Cookson, and George John Cookson, carrying on the business of Lead Manufacturers and Smelters, and Antimony Refiners, and Venetian Red Makers, at East Howdon and Willington-Quay, in the county of Northumberland, and at the borough and county of Newcastle-upon-Tyne, under the style of Cookson and Co., has this day been dissolved, so far as regards the said William Cuthbert. 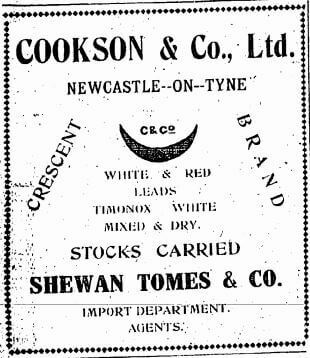 1886 Cookson and Co, lead smelters and manufacturers, Sanderson St, Newcastle-upon-Tyne . 1909 Death of Norman Cookson, head of the company, who had succeeded his father in that position; had displayed a scientific approach to his business; had been responsible for the development of processes for refining lead and antimony, and for extracting silver and gold from lead. 1912 Exhibited a block of pure antimony and a new process for making white lead at the Non-Ferrous Metals Exhibition at the Royal Agricultural Halls. This article was first posted on 28th March 2017. Grace’s Guides – Grace’s Guide is the leading source of historical information on industry and manufacturing in Britain. This web publication contains 119,216 pages of information and 173,136 images on early companies, their products and the people who designed and built them.